It is in the production queue. We process many orders and don't regularly give updates on the progress of individual orders. We take our lead times very seriously and do our best to complete each order on time. All of our product is custom built and we are committed to quality over quantity. Take the guesswork out of your next gift with our Gift Cards. All Gift Cards are custom engraved on Black Walnut and shipped directly to your door free of charge. We ship worldwide. Shipping charges depend on the weight of the order. If you go through the checkout process you will see a final shipping cost before you complete the order. 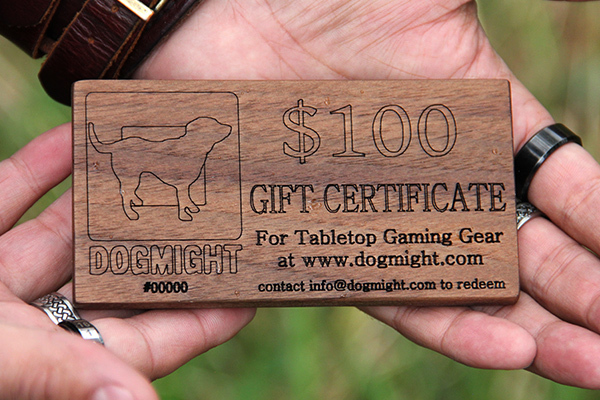 You will receive a notification email from info@dogmight.com when your order ships. Check your spam folder. Yes. Once your order ships. Once you get a 'your item has shipped' notification email you can contact us for a tracking number. Can you build me a custom thing? We love doing custom orders and are happy to make modifications to existing products. However, this is very time consuming and is expensive (think double price). If this is something you want to talk about, drop us a note! I need my order by a specific date!!! We can rush orders if they are reasonable and we aren't swamped at the time. Lead times vary depending on the season and workload. Drop us a note and we will let you know what is possible. Can I get a discount for a bulk orders? Yes, for 5 units or more. We are happy to provide a bulk discount on orders of 5 units or more that are over $350. Drop us a note and we will work something out. Can you send me some free product to review? Get in touch with us and tell us about your audience size, how long you have been reviewing, and which products you are interested in. We recieve a large volume of requests and are kind of selective, so be detailed. Are you really Lumberjack Vikings? We are a group of the most insane Viking Lumberjacks you can imagine. Our shop smells like wet dog, dry timber, and the blood of our enemies.